The Ballou Channing District is host district to GA 2014, June 25-29 in Providence, and General Assembly needs you! 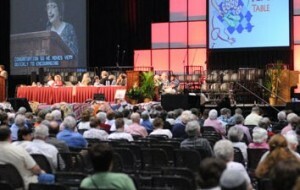 It’s the annual governance meeting of delegates from congregations all across the country, and, as our UUA President calls it, the great “tribal gathering” of thousands of UUs of all ages and interests. It offers multiple opportunities for education, with stimulating lectures and informative workshops, for worship together on both a grand and an intimate scale, for networking, for music, for expanding your horizons and bringing back ideas and inspirations to your congregation. If you’re a delegate, you also participate in UUA governance, shaping priorities and practices for the future. June 25-29 (Wednesday afternoon through Sunday afternoon), in downtown Providence RI. We’ll meet in the Rhode Island Convention Center and the Dunkin Donuts arena (affectionately known as the Dunk), with some events in nearby hotels. And we’ll enjoy Waterfire together on the river Saturday night. Anyone! All are welcome, of all ages. To serve as a voting delegate, you must be appointed by your congregation. But the general sessions, the worship services, the programs and workshops, the exhibit hall, the networking, the music and the fun are available to everyone. There is subsidized daytime day care available by pre-reservation for younger children, a day camp for older children, and an active youth caucus for high schoolers. Accessibility services are provided for those with mobility and other needs. Yes. To participate in General Assembly, you must pay a registration fee. These fees make GA possible. But there are opportunities for free registration by serving as a volunteer, as well as financial aid that you can apply for. And your congregation would make a very wise investment by financially supporting the participation of its delegates, its current and rising leaders and its youth-what you all bring back to the congregation is well worth the price tag. Yes. The theme is “Love Reaches Out.” Learn how to move beyond church walls (both physical and mental), to partner with other faiths and organizations, to reach out to those not typically seen in your pews, to explore new ways of communicating and serving. already has lots of information, and will keep adding lots more as GA gets closer. Give it a look now, and keep going back to it. If you can’t find what you’re looking for there, ask me, or a district board member, or someone in your congregation with lots of GA experience. HOW CAN MY CONGREGATION HELP MAKE THIS A GREAT GA? Apply to present a program-What experience or knowledge might your congregation or people in it have to share that could benefit other UUs in helping them reach out with love? Program proposals are due by November 1; application information is on www.uua.org/ga. Apply to be a GA volunteer-We have need for many volunteers to serve at GA. You might help with the service project, in the onsite office, with greeting and sharing local information, at the registration desk, ushering, assisting with accessibilities, working on the recycling ‘green team,’ making our meeting space beautiful with banners and other décor-many possibilities. Volunteer applications will open March 1st, and I’ll share more information later, but start thinking about the possibility of giving 24 hours of your time at GA.
Be a part of the advance team–This fall, I’m working to recruit some ‘super-volunteers’ who will also put in substantial (and exciting) work well before GA, organizing and heading up major areas like office administration, evening entertainment, and the service project. Have the time and the spirit? Contact me for more information. Offer home hospitality-If your congregation has members living within a half-hour’s drive or public transportation ride from downtown Providence, you can become part of our BCD home hospitality program, which both earns money for your congregation and offers GA attendees a cheaper, more friendly alternative to a hotel room. Each congregation offering homestays will need a coordinator to recruit hosts and work with our district home hospitality administrator. Share your talents-Are you a musician? A visual artist? A juggler? A youth worker? An excellent organizer? A tour guide? We want to hear from you! Spread the word-If you’ve been to GA, tell others about the experience and what they can gain from it. And don’t forget to mark your own calendar-June 25-29.